Burelom (Storm Debris), no. 1, November 26, 1905. 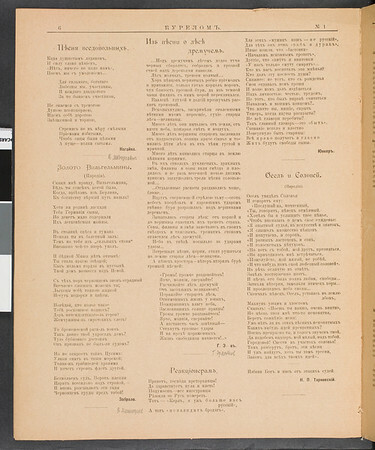 Weekly literary satirical magazine, edited and published by G. P. Erastov. St. Petersburg. Typography: Тоvarishchestvo [Company] "Narodnaia Pol'za" [National Advantage]. Journal of political satire. This issue contains poetry, prose, pictures and illustrations . Two different no.1's and no.2's came out in 1905 and a no.3 in 1906. The other no.1 came out on Dec. 18, 1905. "Burelom" was continued by "Buria," which kept the numeration.